Staining concrete is one of the most popular applications for transforming concrete slabs in the Chicago area. 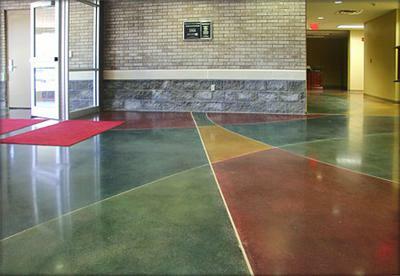 Aardvark Painting offers many different stain concrete colors and designs. Often referred to as colored concrete, homeowners, designers and builders are drawn to stained concrete because of the unique outcome that can be achieved combining colors, application techniques, etc., on cement flooring and other substrates. The results are limited only by the creativity of those involved in the stained concrete process. Because of concrete’s porous qualities and neutral tone, it is the perfect blank canvas for topically applied color. Using acid-based/water-based chemical stains, decorative concrete contractors have been able to achieve rich, earth-toned color schemes resembling natural stone, marble, wood, or even leather, giving a completely custom look to cement floors, concrete driveways, patios, walkways, pool decks, concrete walls and more. 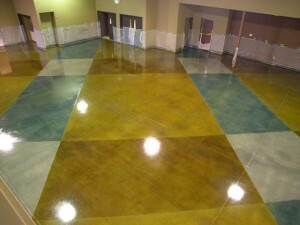 Stained concrete for your home or business offers ease of maintenance for years and years. Using concrete stain is an easy and inexpensive way to spruce up that boring gray concrete and bring some color and life to your patio, porch, basement floor, etc. Instead of paint, you want something that’s not going to chip or flake and let your concrete maintain some of its natural appearance. You’ve probably heard of acid stain and maybe even seen some examples of how these stains can transform the look of a concrete surface. There are also acrylic stains designed for concrete which may be more suitable for your situation and taste. Durability: One of the best qualities of stained concrete flooring is its durability and resistance to wear and tear. Chicago Stained concrete floors offer all of the durability of concrete flooring including high compressive strengths. They will also not warp, buckle, or flake like some other flooring options. Additionally, stained concrete floors are ultraviolet light resistant to resist fading or discoloration. Finally, unlike some concrete paints, concrete stain will not chip or peel. Simple stain applications that include cleanup and a final sealer coat and involve minimal slab preparation will cost about $2 to $4per square foot depending on several variables. Larger projects typically have the lowest square-foot prices. Stain applications with saw-cut patterning and different colors between sawed lines cost $4 to $10 per square foot. Applications with sawed patterns and multiple color buildups are priced at about $8 to $15 per square foot. Sandblast stencil work, including stain, cleanup, and sealer applied only to the stenciled area, runs $12 to $25 per square foot of stencil area. As more and more people are becoming aware of the attractiveness and practicality of using concrete floors in their living and working spaces, stained and sealed concrete is becoming increasingly popular. There are acid stains and concrete dyes that have been developed to add color to concrete. Often I am asked about the difference between using acid stains and concrete dyes in the coloring process. To put it simply, acid stains react with and change the color of the concrete, while concrete dyes simply add their color to the concrete. While there are advantages and disadvantages to both processes, either process can deliver a unique and beautiful finished product. Sometimes we combine processes on the same floor and really get creative! The metallic chlorides suspended in acid stains react with free (chemically active) calcium in the concrete to change the actual color of the concrete’s surface. This reaction can be affected by trace minerals in the concrete, by temperature, humidity and sometimes I think it’s affected by the phase of the moon and the alignment of the planets! Not only do different slabs turn out differently using the same product, I have seen the color of sections of the same slab turn out differently using the same product on different days. This is not necessarily a bad thing. This is simply part of the beauty and mystique of using acid stains to color a floor. You won’t know what your finished product is going to look like until you seal it. Concrete dyes are colloidal suspensions of color pigments. Done right they penetrate into the concrete’s surface and stay there. The color intensity can be controlled by the color density of the dye. Keep in mind that you are adding color to the existing color of the concrete. You want to preserve the character of the concrete. Add too much color and you have “painted” the floor. When properly applied, these dyes create a beautiful effect and give you a lot more versatility and predictability regarding color selection. They also are a good choice for concrete that has been contaminated or discolored. Either way, the colored floor has to be protected with a good sealer. There are a lot of choices and this is where you better do your homework or at least know that your applicator has done his (or hers). The wrong sealer, or the right sealer improperly applied, can turn your project into a nightmare you can’t wake up from. I’ll write more about sealers later.